Fiat chief Sergio Marchionne is said to be the CEO of the new Chrysler Group LLC. TURIN, Italy -- Fiat has selected the three members it will appoint to the board of the newly-formed Chrysler-Fiat entity once it emerges from bankruptcy, including Fiat Group CEO Sergio Marchionne and Fiat Powertrain Technologies CEO Alfredo Altavilla, according to people familiar to the matter. 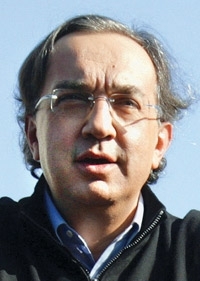 Marchionne, 56, also will serve as CEO for Chrysler Group LLC, the name of the new company. Lucio A. (Lou) Noto will be named to fill an independent director's seat to be appointed by Fiat. Noto, 71, is the former vice chairman of Exxon Mobil Corp. and was CEO of Mobil Corp. from 1994 to 1999, when the company merged with Exxon Corp.
On Wednesday, Chrysler named Robert Kidder, a private-equity investor and former consultant who once did work for Ford Motor Co., as chairman of Chrysler Group. Kidder, 64, will lead Chrysler's board and "protect U.S. Treasury's interests" in the new company, but day-to-day control will fall to Marchionne, a source told Automotive News. Altavilla, 45, co-architect with Marchionne of the alliance with Chrysler, also is head of business development for Fiat Group Automobiles. Noto is a managing partner of Midstream Partners LLC, an investment company specializing in energy and transportation projects. He retired from ExxonMobil in 2001. Noto sits on various boards, including the Penske Automotive Group, Commercial International Bank and Philip Morris International.